Last in line of the four biggest wireless carriers in America, T-Mobile was only known for their relative affordability. In order to change this perception, T-Mobile evolved into a brand that challenged the frustrating norms in a industry that has never been known for fairness and simplicity. With a rebellious spirit, a bold new look, and a big mission on their hands we launched T-Mobile in a direction that has changed the wireless industry for the better. Ridding the world of 2-year contracts was just the start to new era of wireless. 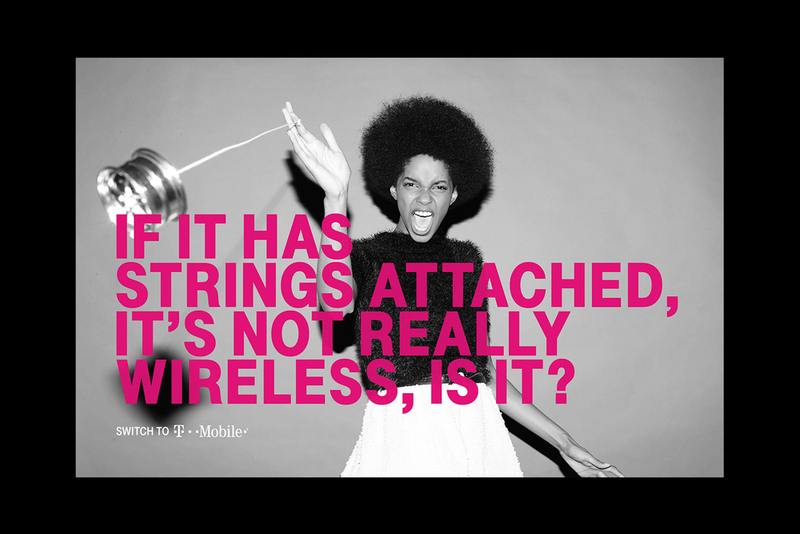 A combination of daring photography, striking graphics, and bold typography ushered T-Mobile's message to the masses. It's T-Mobile's mission to allow customers to experience the true power of mobile without jumping through hoops. Every time T-Mobile unleashes a new "un-carrier" move – abolishing contracts and international roaming fees; giving away streaming music; handing out unlimited upgrades for new iPhones – the other guys do their best to match it. Staying true to the idea that all customer's deserve better, T-Mobile's head honcho even went head-to-head with the bigs dogs and called them out on their BS.